This is one of my most exciting offers! I’ll teach you everything I know about Tropical Smoothie Nutrition with fun and informative guides, blogs, and videos. Whether you’re new to the nutrition game or a seasoned veteran, I have a lil’ something for everyone. This 6 part training series is a combination of research and practical application which maximizes your potential to make and enjoy healthy and delicious tropical smoothies. I absolutely love teaching about topics that you can relate to and wanted to share that with you in an inspirational way. I really unleashed my creative excitement on this content and I hope it adds value to you in a meaningful way. I’ll cover topics such where to get the best sources of protein, fiber, omegas, and other nutrients to help you live a more vibrantly charged life. Sign up below to get my free 6 part training series today (Valued at over $197)! Learning should not only be mind-blowing, it should be exciting too! This is where the rubber meets the road and where the real fun begins. I welcome you to a home like environment where you can feel like a part of the family. I’ll not only reveal how to make the ultimate green smoothie, but we’ll have fun tasting it too! It’s a super awesome experience to join other people in Las Vegas who have similar interests in tropical smoothies. What would it be like if you thought about tropical smoothies in a more encouraging light and were lifted up along the way? This is exactly what you get with each and every tropical smoothie experience. 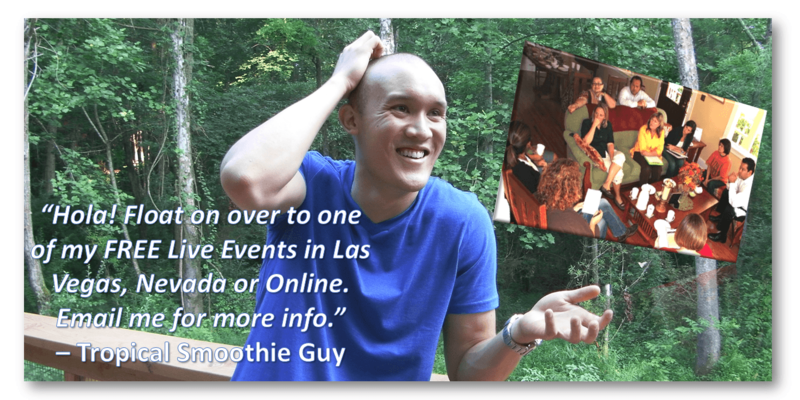 I have an awesome group called “Tropical Smoothie Guy.” This is where I share encouraging information, pictures, and blog posts so you can feel connected to a community of people in Las Vegas and Online. I want it to be as enjoyable of an experience for you as it is for me! P.S. I’m looking forward to meeting you and know that you’ll fit right in! If you don’t live in Las Vegas or would would like to learn more online instead, check out my “Secret” blog for more details on how I can help you out.